A well-being festival combining arts and creativity is set to take place in Liverpool to mark World Mental Health Day. Various organisations from across Merseyside will band together to celebrate Wednesday’s landmark, with several different events taking place throughout the week. The celebratory event has been taking place in Liverpool since 2010, growing from one afternoon of activities to a week-long festival, including music, dance, comedy, writing and other activities. Liverpool has one of the highest rates of depression and anxiety in the country, according to recent figures. One in every five registered patients in the area are suffering from at least two mental health conditions, according to the Public Health England. This event aims to break the stigma and give the people of Liverpool with mental health problems an outlet to share views in a creative and sociable manner. Mersey Wylie, who will be taking part in the festival, told JMU Journalism: “From my perspective, the festival aims to promote and encourage good mental health, especially through creativity and well-being activities, and to open discussions that help people feel supported or understood and that break down the stigma surrounding mental illness. 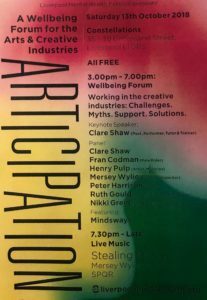 The events running this week will include a musical workshop which will be hosted by Mersey Wylie, a film night and a brand new festival called ‘Articipation’ which is aimed towards people in the arts and creative industries, with workshops, panels and group discussions surrounding mental health. Liverpool Mental Health Consortium set up the festival as a way to use creative and artistic outlets to raise further awareness.